Once you come to work for us, we want you to know you have a future beyond your first job! There are two levels to the program. Basic is the “entry level” and/or apprentice level. Most people in this category have limited automotive repair experience. They possess the desire to become automotive technicians and through a vetting process we feel like they have the necessary skill set to start the process. The Basic techs become part of a mentorship program and work under the very close supervision of the shop foreman (an experienced veteran technician) and typically do basic services. (oil change, tire rotations, wipers & air filters). The Basic position is often filled with individuals who have graduated from a technical training school/program like those of Lincoln Tech, UTI, Apex, etc. As these individuals gain knowledge and experience and demonstrate the desire to advance they are considered for promotion. These individuals will be required to become “Certified” by taking a series of on-line and classroom training courses. 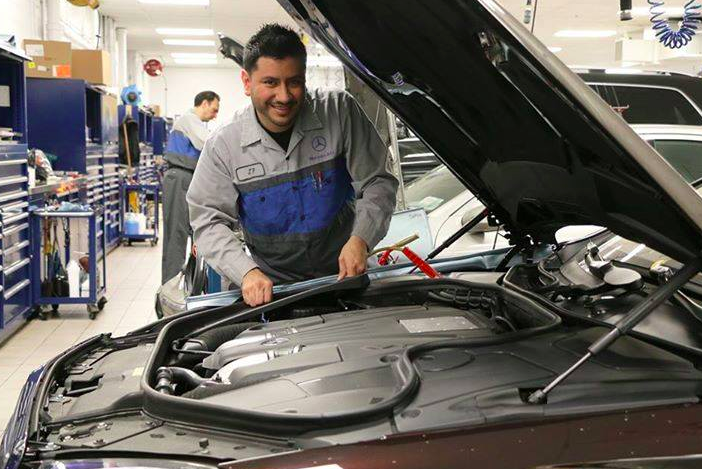 The Pepe Auto Group Advanced technician is an individual that has progressed after demonstrating the proper skill set and the desire to advance. With that in mind, we also will hire someone into this position that already has these skills and training. The type of work performed by a Pepe Auto Group Advanced tech are maintenance items such as mounting and balancing tires, brakes, tire repair, fluid exchange services and some light mechanical repairs. The Advanced tech should also be able to perform diagnostic evaluations and repairs. These individuals will be required to maintain their certifications and stay current with all new product training.